The Raid of Angus took place in 1391 or 1392 (footnote). It was no ordinary cattle raid. It reflected a long standing power struggle within the Stewart Royal family and concluded in a pitched battle between soldiers at the peak of Scottish nobility. The conflict was primarily about land and privilege, but it also illustrated a strong cultural division in Scotland at that time. The Raiders were primarily Celtic, that is of Scots, Irish or Pictish descent, from the highlands, while the defenders were of English and recent European origins, from the lowlands. The leaders of the Raid, including John Ayson were recorded, declared outlawed in the letter produced by Robert III and the Scottish Parliament. The full letter and its Latin original are included in Records of the Scottish Parliament to 1707 of St Andrews University. The names of the leaders of both sides tell us a lot about the Raid and its causes. Duncan and Robert Stewart were the primary leaders. They were sons of Alexander Stewart, Earl of Buchan, dubbed the Wolf of Badenoch. Although that name was probably coined after his death, it undoubtedly matched his fearsome reputation at the time. He was the son of Robert II. At the height of his power he was one of the most powerful men in Scotland. As well as being Earl of Buchan he was Lord of Badenoch, Justiciar of Scotia and Royal Lieutenant North of the Moray Firth, and Sheriff of Inverness. He also held land in Urquhart and Strathnairn, although that was more by force than by right. Even the church lived in fear of him, and up to 1390 he received protection money from the Bishop of Moray, Alexander Bur. Through his marriage to Euphemie Countess of Ross in 1382, Alexander acquired perhaps his most valuable possessions, the Earldom of Ross and shared ownership of Lewis. Skye and Dingwall. Alexander gained much of his power and land because of his ability to lead and control the warlike and independent warriors of the highlands. He was entrusted with that role by David II and Robert II. There were many times however, when Alexander could not, or would not, curb the violent excesses of his men. In likelihood if he had tried to hold them in check too much, he would have forfeited his own position, and possibly his life. His people were Celtic, in whose traditions warfare, feuding and raiding were deeply embedded. At the same time Alexander used this situation to his advantage, often terrorizing his neighbours to further his ends, pay back scores and to demonstrate his importance to the kingdom. This violent activity rose to a crescendo in 1390, when he took advantage of a power vacuum after his father’s death. He also saw the opportunity resulting from the absence of his opponents, Sir John Dunbar and Sir David Lindsay, who were jousting in London. Alexander was in a rage at the Church and in particular with the Bishop of Moray, Alexander Bur. He sacked and burned a series of northern towns of Buchan. He destroyed Pluscarden Abbey, 18 mansion houses of the clergy n Forres, the monastery of Greyfriars, St Giles parish church, the Hospital of Maison Dieu and most notoriously of all, Elgin Cathedral. Alexander’s long standing grudge against Bishop Bur had a number of causes. For a start, it had proven impossible for him to gain full control and rights to taxes from the Church in Buchan. In a snub to Alexander, Bur also turned foolishly to Thomas Dunbar for protection Dunbar clearly could not give. More personally, Alexander Bur had refused to help Alexander with annulment of his marriage to his wife Euphemia of Ross. Despite the huge gains marriage to Euphemia had brought, things had not gone well, and he abandoned her to return to his former mistress, his wife by Celtic tradition, Mairie niaghe Eachann. Alexander had many sons with Mairie, including Duncan and Robert Stewart. By 1392, Alexander was weakened by repeated penalties for his behaviour. That had included large payments and forfeits to reverse excommunication by the Church. At the time of the raid of Angus he appeared subdued and took no obvious active part. There is little doubt however, that he supported and encouraged his sons and allies in planning and mounting the Raid. Duncan and Robert Stewart shared Alexander’s anger as when he lost land, so did they, whether immediately or as part of their inheritance. They were angry with the Church, with Robert III and with Alexander’s other brother, Robert Duke of Albany. Albany was Regent to the Crown and for a time the real power of the throne, as Robert III had sustained a bad injury from a horse’s kick. Albany was also someone whose support for Alexander was limited to say the least. Despite all these enmities, Alexander, Duncan and Patrick saved their greatest anger for Sir David Lindsay. Lindsay’s strength as a knight and soldier threatened Alexander and his sons, because the Crown increasingly thought they could rely on him and others to police the realm rather than Alexander. Lindsay was also the husband of Alexander’s half-sister Elizabeth. He was the rightful owner of Strathnairn, which Alexander occupied. As Alexander’s influence waned, Lindsay was able to call for this land to be returned with greater confidence. David Lindsay was a great soldier like Alexander, but otherwise a very different person, renowned as the archetypal “gentleman” knight. Of Flemish stock, he was said to be a direct descendant of Charlemagne. Tales of his exploits and chivalry entertained the courts of Europe. He famously defeated the English champion, Sir John Welles in a jousting match on London Bridge. That took place in 1390, when Alexander was ransacking Moray and burning Elgin Cathedral down. The story ran that Lindsay won so easily he was jeered by the crowd, who believed he was nailed to his saddle. To prove them wrong, he jumped off his horse, and back on unaided, which was no mean feat. To complete the story and cement his reputation, he spared the badly wounded Welles and befriended him throughout recovery from his wounds. No doubt his fame rubbed salt in the wounds for Alexander and his sons. Robert de Athollia was another who had a score to settle with Sir David Lindsay. He was married to Jean Stirling the daughter of Sir John Sterling. He had expected to inherit land in Angus particularly Glenesk from Stirling. Instead it had been given to Alexander Lindsay who married Stirling’s other daughter Katherine. Their son, again Sir David Lindsay, inherited Glenesk, and a huge swathe of land in Angus. Robert Atholl was the father of Duncan and Patrick Donaldson. They were all sons of Duncan the Stout, who had distinguished himself in the Scottish Wars of Independence, particularly at Bannockburn. Duncan the elder was now dead but he had been the first Head of Clan MacDonnaidh or Clan Donaldson, which later became Clan Robertson. The Raid of Angus is said to be the first time “modern day” clan structures were mentioned. Much legend and speculation swirls around the origins of the Scottish clans. However, the letter of Parliament mentions “Clanqwhevil” as a distinct group presumably of family members and allied families. John Ayson the younger, “Johannem Ayson juvenem”, was neither Royalty nor nobility, but nevertheless of a notable family. His identity is discussed under Origins. We know a surprising amount of detail about the Raid from the letter of Parliament of 1392, and from Andrew of Wyntoun’s “Original Chronicle of the history of Scotland” of the 1420’s. Other accounts such as Bower’s Scotichronicon of the 1440’s, and numerous subsequent accounts provide additional information but seem less well informed. .
Wyntoun said there were 300 or more Raiders. From the names and numbers of their leaders that seems reasonable. The names indicate the men came from far across Alexander Stewart’s lands as Skene in Celtic Scotland pointed out. Sir David Lindsay was aware trouble was likely so he arranged a meeting to try to end matters peacefully. The highlanders did not turn up however. In an effort to learn what was happening, Lindsay despatched a scout to spy things out, but the scout never returned. The raiders then launched their attack suddenly and almost certainly as stealthily as possible. Parliament’s letter implies the raiders burned and destroyed much property as they went, killing people they came across. That may well be so, but it also stands to reason the raiders would have moved as quickly as possible as they knew defenders would be at hand somewhere nearby. The most reliable versions of the story do not go into detail about the route taken by the raiders. Some versions suggest they travelled down Glenisla from Glenshee, which sounds plausible. That would afford the greatest protection and cover. If they did indeed arrive that way, it also seems likely they would have bolted as fast as they could once they emerged from the glen. They were limited in the speed they could travel at by the animals they drove. Some suggest there were as many as 3000 cattle and horses. How anyone could know that figure is unclear, but it is not out of proportion with numbers from other raids. Wyntoun speaks very confidently of events once the alarm was raised. Sir Walter Ogilvy, Sherriff of Angus was at Kettins, rather than at his own home in Auchterhouse, There he was told the raiders were close to the River Isla in Stormont a few miles away. Sir Patrick Gray, was away from his home of Foulis near Dundee, but close by Ogilvy. 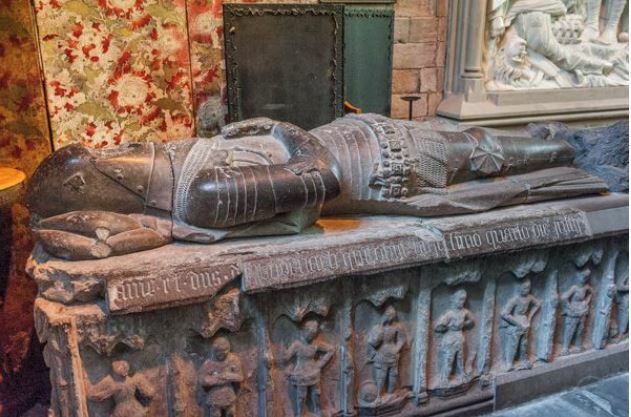 Meanwhile Sir David Lindsay, was at Dundee rather than at his home at Edzell Castle, about 20 miles away. Ogilvy and Patrick Gray and others including Sir Walter Lichtoun joined forces and attacked the raiders at Glasclune. Wyntoun describes Sir David Lindsay and men fighting alongside them on the battle field, although his words perhaps suggest they joined once the fight was in progress, That seems possible, as Lindsay had been around 25 miles from Glasclune, whereas Ogilvy and Gray had been just twelve or thirteen miles away. 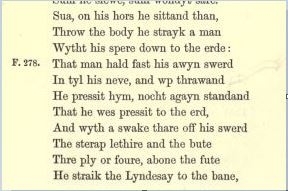 Wyntoun suggests the action started and ended at Glasclune. Bower and others, such as Fittis suggest one or more skirmishes along the length of Strathardle also took place, with the biggest of those being at Brerachan at the head of Strathardle. In all, Wyntoun’s account seems most plausible. The lowlanders were heavily outnumbered and likely badly defeated at Glasclune. To have continued to harass the raiders and attack again at Brerachan, with fewer men, and then for the badly wounded to escape back down Strathardle with their lives sounds slightly implausible. There also seems to be some uncomfortable similarities between tales of an extended conflict with those of much earlier legendary battles against the Danes at Brerachan and other sites. However the action played out, the engagement was bloody and brutal. The heavily armed knights of the lowlands wrought havoc amongst the highland foot soldiers. Sir David Lindsay was singled out by Wyntoun for having killed many men. Despite their superior arms however, the lowland knights were overtaken. Glasclune most likely means “green meadow” in Gaelic. It was an important route into the highlands, as borne out by the later building of Glasclune castle. Despite the description of it being a meadow, the land could well have been uneven and soft, on at least some gradient alongside Lornty Burn. The more agile highland foot soldiers, in their greater numbers were able to evade the armoury and surround the knights and cut them down. Sir Patrick Gray was rescued only by loyal soldiers who crowded around to protect him. It appears the knights were also taken aback by the ferocity of the highlander’s charges. An exchange involving Sir David Lindsay underlined the barbarism of the encounter. He is said by Wyntoun to have pinned a highlander to the ground with his lance, dealing him a mortal wound. The Highlander responded by hauling himself up on the lance and hacking savagely at Lindsays leg. That last dying blow cut through Lindsay’s leather stirrup, and his three or four ply boot to the bone. The reference is probably to a leather boot, but there it would still have been an extraordinary blow. Lindsay survived, although he was badly wounded. Again he was saved by loyal men who carried him away from the field. Sir Walter Ogilvy was killed, along with his brother in law Sir Walter of Lichtoun and most of the rest of the 60 knights according to Wyntoun and others. . Many must have died on both sides. Gibbone Duncanson was mentioned as a leader by Wyntoun, but the letter from Parliament does not mention him. Perhaps he was another who lay amongst the dead. The loss of face, property and life for Lindsay and the crown would have been a cause of great celebration for the highlanders as they headed back to Strathardle and Atholl. The power of the throne remained intact however, as subsequent events proved. The culprits were declared outlaws in town squares. The letter from Scottish Parliament at Perth on 23rd March 1392 was addressed to the Sherriff and law keepers of Aberdeen. It warned them not to support the outlaws. It demanded they be hunted down and slain, or handed over to the king’s justice. Failure to comply with the order would incur the greatest penalties, while it was said, culprits who gave themselves up to justice might avoid losing their land, wealth and families. Alexander Stewart’s sons, Duncan and Patrick were imprisoned at Dundee Castle. That and other sanctions against Alexander Stewart seem to have been effective in keeping him in check until his death around 1405. Some suggest he was given office in the South for the remainder if his life. The extraordinary toleration shown Alexander and sons despite such grave misdemeanours suggests how precarious the throne was, and how much it relied on Alexander Wolf of Badenoch and his family to keep the highlanders in check. That was one of the points he and they wished to make no doubt. Duncan and Patrick Stewart were eventually released, although others of the raiders were likely not so lucky. Many may have been hunted down and put to death. Some may have headed deeper into the Highlands of the North and survived perhaps under protection of Alexander’s son, also named Alexander who became Earl of Mar. As for John Ayson the younger, we do not know his fate. Maybe he and other Aysons escaped to safer places in the North. 1392 is suggested for the raid by Andrew de Wyntoun, the most reliable historian on the subject. Bower suggested it was in 1391, which is possible. Other dates claimed, are not plausible as it was March 25th 1392 when the Scottish Parliament responded to the raid by a letter written to the Sherriff of Aberdeen. Considering the leaders had been outlawed by the time of Parliament’s letter in March 1392, and considering the Raiders needed to plan and would have been limited by winter months, it seems quite possible they chose a day before winter started for the Raid. Stuart McHardy in his book School of the Moon points out Cattle Raids were often undertaken at Michaelmas that is in late September. The Autumnal equinox of that time of year gives the longest daylight, and the richest months of the year have gone. Its a date we are unlikely to ever know.